之前去Penang Adventist Hospital Wellness Centre做身体检查,现在报告出了. 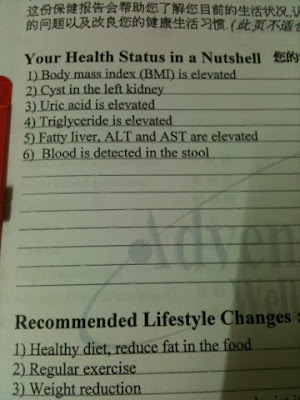 尿酸(URIC ACID), 甘油三酯(TRIGLYCERIDE)过高,脂肪肝(FATTY LIVER) 等. Blood in stool.... have to check.